What's The Cheapest Rental Available In Society Hill, Right Now? Finding a good deal can be a challenge if you're apartment hunting on a budget. So what does the low-end pricing on a rental in Society Hill look like these days--and what might you get for your money? We took a look at local listings for studios and 1-bedroom apartments in Society Hill via rental site Zumper to find out what price-conscious apartment seekers can expect to find in this Philadelphia neighborhood. Listed at $975 / month, this 400-square-foot apartment, located at 325 Spruce St., is 15.2 percent less than the $1,150 / month median rent for a studio in Society Hill. The unit has hardwood floors, granite counter tops and ample natural lighting. This apartment, situated at 704 S Washington Sq., is listed for $1,095 / month for its 600 square feet of space. In the unit, you're promised air conditioning, tile flooring, stainless steel appliances and plenty of closet space. There's also on-site laundry available. Cats and dogs are not permitted. Here's a 1-bedroom, 1-bathroom apartment at 334 Lombard St., which is going for $1,395 / month. In the unit, you'll find air conditioning, hardwood flooring, in-unit laundry, a dishwasher and great natural lighting. Cats are welcome. Then there's this 600-square-foot unit with one bedroom and one bathroom at 727 Spruce St., listed at $1,460 / month. In the sunny unit, expect air conditioning and hardwood flooring. Pet owners, inquire elsewhere: this spot doesn't allow cats or dogs. Building amenities include on-site laundry. Listed at $1,465 / month, this 700-square-foot 1-bedroom, 1-bathroom apartment is located at 530 S 2nd St. When it comes to building amenities, expect garage parking, a fitness center, concierge service and an elevator. In the unit, you'll find hardwood flooring, a fireplace, in-unit laundry and a dishwasher. Unfortunately, pets are not permitted. This 1-bedroom, 1-bathroom condo, situated at 636 Spruce St., is listed for $1,550 / month for its 650 square feet of space. In the unit, look for hardwood flooring, a dishwasher and ample natural lighting. Neither cats nor dogs are allowed. And here's a 1-bedroom, 1-bathroom apartment at 406 Spruce St., which is going for $1,585 / month. In the bright bi-level unit, you're promised air conditioning, hardwood flooring, a walk-in closet, in-unit laundry and a dishwasher. Cats are welcome. Over at 305 Pine St., there's this 1,600-square-foot 1-bedroom, 2-bathroom apartment, going for $1,595 / month. In the unit, you're promised both air conditioning and central heating, hardwood flooring, a deck, a fireplace, a dishwasher, a walk-in closet and a spiral staircase. Sadly for pet owners, animals are not welcome. The building has on-site laundry. 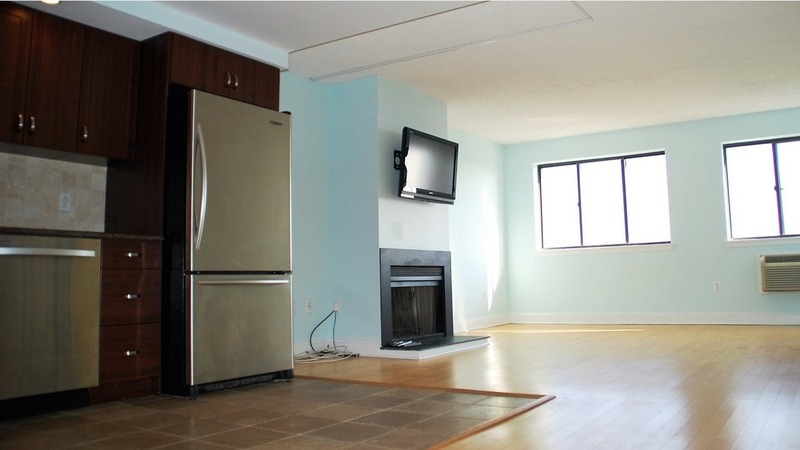 Listed at $1,645 / month, this 1-bedroom, 1-bathroom apartment is located at 510 Spruce St. In the sunny unit, you'll find air conditioning, hardwood flooring, a fireplace and exposed bricks. Sadly for pet owners, animals are not allowed.